I have been looking for a great resaw blade for my Rikon 14” deluxe bandsaw for a couple of years. I have used he woodslicer blade with some success but it gets dull and it doesn’t do a good job. I seen adds on the resaw king so I thought I would give it a try. The cost is 149.00 but after using it money well spent. The cut you get plus the ease it cuts all I can say is WOW! This is the best resaw blade I have ever used bar none. The fact that it has carbide makes for a great cut an extends the blade life I shouldn’t have to buy another one. I resawed an 8” wide piece of walnut with very little resistance. I didn’t know they made carbide blades for 14” saws. That will last a lifetime. I think they can put a new tooth in it if you should hit metal or a rock, too! with thinner profiles for smaller wheels. How wide is your blade (and do you know the thickness)? I use HH WoodSlicers and love them, but you are correct about them getting dull rather quickly, especially if cutting exotics. Thanks for posting this review—I was just looking at similar blades, and thinking that they cost SOOO much. I’m a hobbyist, so it’s hard to pony up those $$$. If an average resaw band saw blade is $35—is it possible for a hobbyist to go through five of those, and that the $150 Resaw King one will still outlast/outperform the six? Just curious—I really don’t know, since I just got a bandsaw….. This is interesting as I have not bought a blade like this because I thought it would be too difficult to tension properly. It appears that it has been tensioner well enough to do a fine job of resaw. The Resaw King is only very slightly thicker than the Woodslicer. 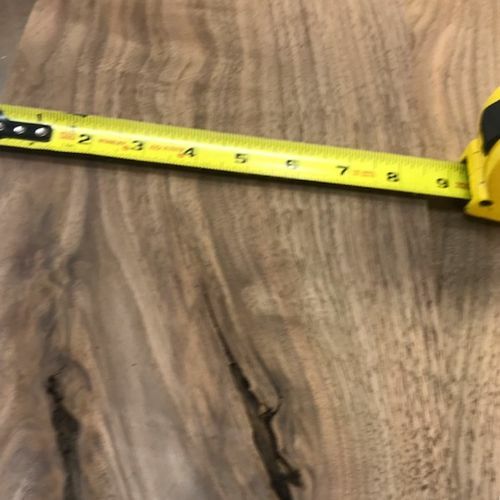 I have the tension to the max but I got no deflection resawing the 8 1/2” walnut or a piece of cherry sliced to just over a 1/16”. The blade is 3/4” wide. The reason I bought was I filled in at the Vocational School teaching CAD for 7 weeks. That job paid for the resaw blade and a drum sander, not bad for a part time retirement gig. I will review the supermax 16-32 drum sander after I pick it up Thursday November 2. I’ve been scared to buy a carbide blade, due to the possibility of a “rollup” where the blade catches the wood, rolls it up into the blade and ruins everything. Had it happen one day cutting the back off a bandsaw jewelry box drawer. Ruined a $34 Timberwolf in short order. I think it was the third cut on that blade. Surprisingly, the drawer survived, but the ensuing bends in the blade caused me to pull it and toss it. But the carbide has always been a thought. Money comes into play also. Glad you love it! Thanks for the post Woodmaster1! I have this same blade and width (my saw uses a 115” blade)—but I have not used it yet. I also have the Supermax 16-32 and I think it’s a great sander! I agree that the Woodslicer does a very good job when sharp—but it does get dull. I bought the blade because of the good reviews, but it was difficult to justify the extreme cost. Tennesse: I’m not familiar with the “rollup” issue. I’m not a very experienced bandsaw user, so maybe this is a known safety issue? I was aware that the blade could break. But it sounds like you are saying that the material you are cutting is somehow picked up by the blade? Does your bandsaw blade travel in a counterclockwise direction up from the table? I must be confused. OR——are you saying that the blade jams or stalls in the work piece and then the momentum causes the blade to bend or get twisted in the workpiece? I can see where this might happen if the blade is extremely dull or the tension is to low or the blade hits something hard (e.g. nail). Can you provide any pictures or videos or maybe a link to something where we can see this happen or view the aftermath? Tennesse the blade roll up happens when unsupported wood (curve up not down) or round object that get away from you. If it is supported or laying flat you should not have any issues. 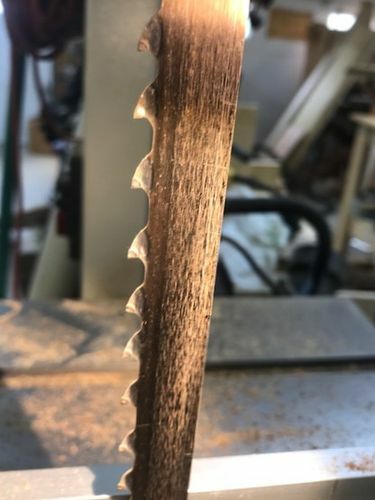 I’ve always found it interesting that woodworkers will pay any price for a premium tablesaw blade, but are not willing to pay for a premium bandsaw blade. It sounds like the price has come down since the last time I looked. I think it makes perfect sense to use a carbide blade. If it outlasts 5-6 steel blades it will be well worth it. Every time a steel blade goes dull, you’re apt to ruin a cut. With the price of wood it could pay for its self pretty quickly doing re-sawing. 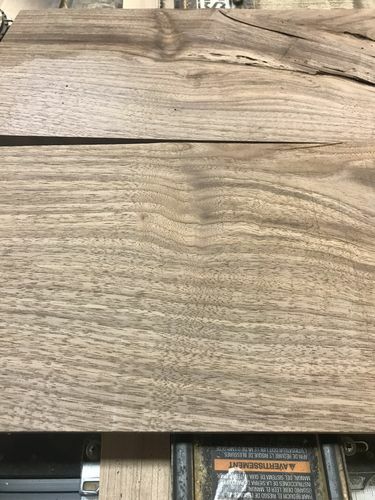 Lets see Red Oak at $2 per board ft 6 ft long log 12 inches wide (easy math). There you are… Many people have wood on their property or from friends that they could do some resawing and be a head pretty fast. I am thinking of buying one for our hobby woodshop on base (military). Our bandsaw blades are terrible, so the only resaw capability we have is a tablesaw that limits it to 8” wide. Between flipping the piece and blade width, you are lucky if you can keep from loosing 1/4” on each slice. As expensive as some of the wood I cut is, this could pay for itself in one project. So after I read this I went out to the shop and put on my brand new Re-saw saw blade. Wow it was wonderful and cut so even. I see some simple cutting boards in the near future. It’s important to note that there is a 12 month warranty on the Resaw King. My interaction with Laguna could not have been any better, I contacted them through their online chat Thursday night and after emailing a copy of my receipt and a photo of the blade Friday morning a new blade was on the way Friday afternoon.